Starting on May 14, a new model of MG cars will appear in dealerships across Britain. It is an event long awaited by MG fans across Britain and around the world. It signifies not only the return of one of Britain's oldest and most popular auto brands, I am proud to add that the new car is also the latest example of Sino-British joint venture. China shares the mythology of the famous phoenix firebird with many countries. Chinese people believe that when the phoenix is 500 years old it ignites its nest and burns. Then the phoenix arises from the ashes newly born, and even more vigorous. The phoenix story was a perfect fit for the extraordinary relaunch of the MG brand. I witnessed the coming off the line of its new model the MG6 at Longbridge a few weeks ago. I saw the Birmingham City Leader, Councilor Mike Whitby, proudly drive a sparkling new red MG6 down the assembly line; he was greeted with wild applause from hundreds of MG fans, along with Chinese and British workers at the plant. It is 16 years since a new MG model rolled off the Longbridge lines. The MG6 is the first car designed, developed and built in the UK by the Shanghai Automotive Industry Corporation (SAIC) since its acquisition of MG. The MG6, like a lusty new-born phoenix, brings rebirth to a quintessential British brand name. I was delighted to read in the Telegraph Rod Ker's comments after a test drive of the MG6: "I like it…Impressive". In Autocar the test drive got this accolade: ".. we say bring 'em on." Founded in 1924, the MG is an iconic British sports car. An SAIC manager told me that SAIC has been working hard to return the MG marque to its old glamour; first, through small-scale warm-up production of the MG-TF sports cars in 2008 and now the launch of the new MG6. Very soon, other new designs could spring to life off the drawing board. MG must be very popular as there are 86 MG Clubs around the world. Some of these MG fans chose to celebrate the MG6 launch by driving a dozen classical MG models at the launch ceremony. 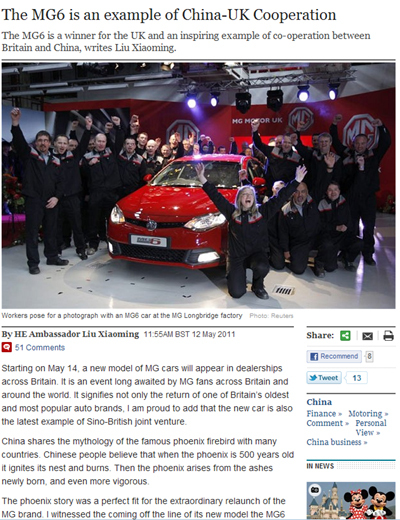 Aside from this MG popularity, the MG6 is a splendid example of the burgeoning China-UK business collaboration. I often hear talk, in both our countries, about the great promise of the complementary strengths of our two economies. The launch of the MG6 is living testimony of that vision. The MG6 was designed and developed in Longbridge; then the new model had most of its parts built in the SAIC Shanghai factory. These parts were then shipped to Longbridge for assembly and testing. The concept of "designed in the UK, produced in China and assembled in the UK" enables the MG to retain its marque tradition of "Made in the UK". This formula draws together British innovation, advanced manufacturing, and China's competitive costs. The MG6 in every way adds up to success for China, a winner for the UK and a tour de force for co-operation between our two countries. The MG6 showcases the spirit of corporate responsibility as Chinese businesses seek to go global. In 2005 the Nanjing Automobile Company (NAC), purchased the assets of the MG Rover Group. In turn SAIC took over NAC in 2007. Both NAC and SAIC decided to maintain MG's Longbridge facility as an engineering and design centre. The facility employs about 400 people and is now moving back into production. This means the famous Longbridge plant is increasingly contributing to local job creation and economic development. It's a perfect example of a Chinese company fulfilling its responsibilities to the local communities. The launch of the MG6, and the planned other new models, will create more jobs in sales, logistics and maintenance. In my 14 months so far in Britain, I have been learning about British strengths. I have visited more than ten British leading universities and many factories, and recently the Science Museum in London. These experiences opened my eyes to Britain's outstanding contribution to science and technology. Low carbon and sustainable energy technology advances are a top priority for both our governments. A wave energy project in Scotland, the BRE Innovation Park in England, and other visits have reinforced my impressions. These experiences have convinced me that Britain is leading the world in new energy, high-end manufacturing and the creative industries. The UK, furthermore, is a top investment destination in Europe, thanks to its legal system and open investment climate. Conversations with many officials, business leaders and employees of Chinese businesses and organisations show they share my impressions. More collaboration between China and the UK offers boundless opportunities. This can be driven by China's growing development. China is going to keep a fast and steady economic growth in the next 5 years. The blueprint behind this economic development is China's five year planning cycles. The outline of the 12th Five-Year Plan has just been published. This will steer China to upgrade its way of growth by boosting domestic demand; a balance will be found between imports and exports and priority will be given to both inbound and outbound investments. Overall there is a strong stress on making growth green and low-carbon. The successful launch of MG6 is only one shining example of what can be achieved through collaboration. Britain is a global leader of advanced automotive engineering and design. The proof is demonstrated with over 80 per cent of all Formula One racing cars being designed and built in Britain. China is the world's biggest automotive market, so close collaboration will undoubtedly benefit both our countries in this and many other industry and service sectors. Let us embrace a better future through ever more China-UK business collaboration.